Since we don’t have alligator skin and a heart of stone, people will hurt us especially those closest to us. We also make mistakes in life and hurt others. 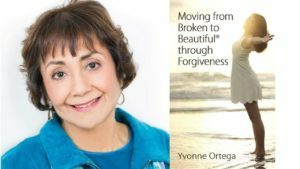 Yvonne uses personal anecdotes and the timeless truths of God to help women trade shame and guilt for God’s grace to forgive themselves, to overcome anger and bitterness and with God’s power forgive others, to break free from the prison of the past, and gain the peace and freedom of forgiveness. With forgiveness comes living life to the fullest. This is book three in the series, Moving from Broken to Beautiful®. Thank you so much, Cathy, for your support and encouragement! To order Moving From Broken to Beautiful through Forgiveness click here.